If you were to take an inventory of all your preparedness supplies, would you feel quite confident that you are in fact “ready”? Your supplies might include a good, well thought out long-term, food storage program, complete with a variety of dehydrated and freeze-dried legumes, grains, vegetable, fruits, dairy and meats. If you’ve come this far, you are commended for taking two giant steps toward emergency preparedness. But have you also considered the process by which these foods are preserved? Did you know that both the dehydrating and freeze dried method destroys the essential enzymes your body needs to help utilize the nutrients in the food itself? These processes may prevent food spoilage thereby facilitating the luxury of long-term storage, but fails to provide the body with the essential enzymes necessary for good health. To give you an example of how enzymes work and why they are so important for your health, consider this: Have you ever dropped an apple and noticed a bruise form? What happens to that bruise over time? Underneath the skin, enzymes are busy at work breaking down that apple until there is nothing left. The exact same thing happens with the enzymes in your digestive tract. These mighty, enzymatic “powerhouses” perform their magic, breaking down the food to its constituent parts – vitamins, minerals, carbohydrates and protein – so the body can ultimately use it for life and vitality. Without them, we are borrowing from our body what it was never designed to do. To use the old adage, we are “robbing Peter to pay Paul”. Yes, the body is thankfully equipped with the means to also digest these essential nutrients with a flood of digestive enzymes, from amylase in your saliva, to gastric lipase, pepsin and rennin in your stomach mixed with hydrochloric acid. The partially digested food (chyme) then empties into your small intestine where liver bile and pancreatic enzymes continue to breakdown the food so the nutrients can be absorbed. There is a kink in this unreliable system though. Over time and with abuse, the body is forced to pump out all the enzymes needed for digestion, and eventually the body breaks down. Hence, we see the rise of such horrific, degenerative disease like diabetes, heart disease and cancer – to name a few. Instead of the food enzymes breaking down our vital nutrients, our bodies are breaking down and we wonder why. Shouldn’t we be concerned about the nutritional aspects of the daily staples of life, including our food storage? Wouldn’t we want to be of optimum health especially if catastrophe strikes? After all, once food ceases to be available in the marketplace and everyone is forced to fend for themselves, there won’t be fresh vegetables or fruit to replace our vital enzymes. Setting aside something now that will provide fresh greens year round just makes perfect sense. That was a concern we faced as individuals, and as a self reliant, emergency preparedness business. We sell good, wholesome dehydrated and freeze-dried food products from some of the most reputable companies, yet the food was depleted of essential enzymes. Sad to say, our eating habits too resembled the typical American diet. In our quest for answers, we made a drastic shift in our own eating habits by choosing healthy, unprocessed food, incorporating a variety of wholesome grains, fresh fruits and crisp vegetables into our diets, including sprouts. Could the answer to our food storage dilemma really be that simple? That we could live off our food storage, enjoy the crisp taste of nutrient-packed veggies while experiencing good health all with the simple usage of sprouts? You got it! Sprouts are living foods packed with living enzymes ready to take food to its next level. In fact, alfalfa sprouts are one of the healthiest foods available to man with such vital nutrients as calcium, copper, folate, iron, magnesium, manganese, phosphorus, potassium silicon, zinc, Vitamins B, C, D, E and K. Not only do sprouts possess all these nutrients, they’re alive and full of enzymes! By the simple application of sprouts in your long-term food storage, you too can enjoy the fresh crisp flavor of vegetables, employing every nutrient for the health of your body from otherwise, “dead” food. Sprouting is so easy, anyone can do it! It requires no special knowledge or complicated equipment, just sprouting seeds, a sprouter kit, moderate moisture, warmth, and maybe five minutes of your time daily. The seeds not only store well, but a little goes a long way. 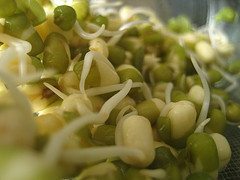 In fact, just one pound of alfalfa seeds can produce about ten to fourteen pounds of tasty, fresh sprouts! Simply sprinkle some seeds in your sprouter kit, cover with water, soak overnight, drain and lightly water for a few days. Then, voilà, watch them grow! Soon you will have a bountiful crop of healthy sprouts to incorporate into your long-term food storage plan! Get to know guest poster Roxanne Griswold better on her blog, Ready-Made Woman, and visit Ready Made Resources for your preparedness needs. 1. Cut off a soda bottle about 5-6 inches above the bottom. 2. Place your beans of choice in them (not too many, they expand while sprouting!) and fill the container with water. Follow the instructions on the package about the time they need for watering. If you water some of them too shortly it might be dangerous to eat the sprouts. 3. Place some fabric on top of it like thin white curtain (sorry, I don't know the English name for it, is it gauze?) and pour the water off. 4. Let the seeds sit on the window sill in the sun. The UV-Light helps the sprouting process. 5. Each morning and evening water them for 15 Min. and pour off the water. 6. Depending on the sort of beans you have after about 3 days – there are your sprouts. I personally love to sprout dried lentils. They are easy to sprout and very delicious. I am trying to figure out how to store my beans and legumes so that I can sprout them later. I know how to sprout already, but I had read somewhere that if you store them in #10 cans with oxygen absorbers that they will not sprout afterward. Is this true? If so, should I store them in #10 cans without oxygen absorbers? How long will their shelf life be? Thank you SO much for your time! I figured that the seed vault in Norway would have something on saving seeds and then sprouting them later. Seeds that are dry need no oxygen so the oxygen absorbers shouldn’t matter. Also checked on the LDS site and one guy has been using carbon dioxide to store the seeds. Although he didn’t say if he was sprouting the seeds or eating them. Every attempt I have made so far at sprouting results in mold. I have tried wheat, quinoa, and chia seeds. Everything molded before the sprouting got started good. What am I doing wrong? Try using less water, Donna. You might also try setting the sprouting jar in a cooler location. I’m not an experienced sprouter but a website I saw said that what looked like mould could actually be roothairs…I saw this on alfalpha sprouts and broccoli sprouts…also rinse a couple of times a day…maybe you can find a website to double check that info….